I spotted the sign shown above as I was exiting Shanghai’s Pudong airport last week, and although the signmaker’s translation skills are sorely lacking (the bottom sentence should read “Please don’t play in the water.”), the message stuck with me as an appropriate one for those looking to earn their fame and fortune in China’s movie business. 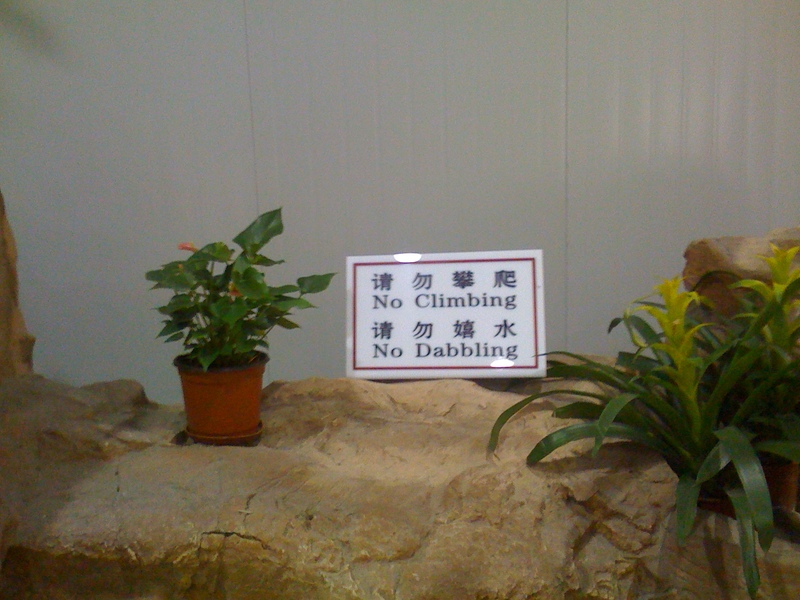 No climbing, no dabbling. Precisely! Understand the hierarchy, especially the government culture, don’t try to overstep your bounds, and don’t dabble because things are moving so fast here that if you fail to move and adapt quickly you’ll get left behind. It’s a culture that Hollywood’s studios generally abhor, and for that reason they’re mostly opting out of the China boom, leaving the money and opportunity to entrepreneurs and risk-takers. And there’s so much money and opportunity, even (perhaps especially) for foreigners who respect the rules. From small private startups to the biggest state-owned enterprises, China’s film industry is awash in cash, hungry for success, and eager to partner with people who possess know-how and international access. In my recent China travels I’ve met a 30ish entrepreneur who has poured at least $25 million of his own money into a state-of-the-art post facility; a former government employee who controls an enormous production facility and sizable production fund; and countless others who are prepared to fund movies and entertainment ventures if they can only find investable projects. Recognizing that commercial filmmaking skills and business savvy are in short supply in China, most of these folks are happy to collaborate with–and in many cases finance–foreign professionals. Even the huge and stodgy China Film Group, the supposed dinosaur of China’s film industry, has aggressively embraced foreign talent, reportedly placing more than two-thirds of its upcoming film projects with international directors. One of the biggest budget films in China’s history, Beijing Forbidden City Film Company’s Wolf Totem, is in the hands of French director Jean-Jacques Annaud. It’s a sign of the heady times in the PRC that Annaud was granted approval to direct Wolf Totem even though he’d been previously banned for making the anti-PRC film Seven Years in Tibet. One major way that foreign influences have seeped into China is the increasing prevalence and success of Hollywood-style storytelling in locally made films. Pictures like Lost in Thailand, Finding Mr. Right, So Young, Drug War and American Dreams in China have attracted giant Chinese audiences by co-opting western storytelling techniques, and in some cases adapting Hollywood hits to the local culture. This an encouraging trend, one that bodes well for skilled western writers and filmmakers who are willing to give China a go. 1. Meet them more than halfway. Chinese investors tend to be more likely to place their capital at home than overseas. Co-productions are fine, whether in Mandarin or English, but don’t expect them to finance your quirky indie comedy or heartfelt drama unless it can shoot in China with Chinese elements. Chinese movie investors neither understand nor trust the foreign marketplace; most will only invest if they’re confident they can make their money back in China. 2. Brand name drop. If you want to get a Chinese investor’s attention, there’s no better way than to trot out some brand names with which you can claim some association. Can you get a major movie star involved? Are you or have you ever worked for one of the major Hollywood studios? Did you get a masters degree at Yale (or better yet, at Beijing University)? Can you work the words “Goldman” and “Sachs” into the conversation? Few PRC investors have the ability, or even the interest, to assess the quality of your screenplay, but a strong brand name they recognize will help you to swiftly cut through the clutter. 3. Be sensitive to the culture. Just as in Hollywood, there are many cultural, social, and business rules that must be obeyed if you’re to have a reasonable shot at success. Too many foreigners show up with little understanding of how things work in China and reveal themselves as ‘barbarians’ who are best avoided. 4. Bring protection. China can be a rough-and-tumble place, and foreigners are often treated as targets for exploitation (and sometimes amusement). It’s best to have a local partner or ‘sherpa’ to guide you through the minefield. A great source of information and advice is the Harris Moure law firm’s China Law Blog. Several friends recently asked me if I’d be attending Cannes this year, and I felt compelled to reply “What for?” The action is all in the East these days. Of my scores of Chinese film business contacts I’m only aware of two who bothered to attend the Cannes festival this year. Better to spend your time at the Shanghai Film Festival in mid-June, where you can participate in a relevant and rapidly growing scene. So don’t dabble, book your ticket and hotel room before everyone else squeezes you out. Although business at China’s movie theaters cooled off a bit last week compared to the prior week’s scorching, record-crushing $135 million gross, attendance was still hot enough to make it the second best week in Chinese cinema history. The $95 million cume for week 8 was 163 percent higher than the total for the same session in 2012. Journey to the West led the way with $54 million, the second best second-week showing ever for a Chinese film, after Lost in Thailand’s Christmas week bonanza. At $160+ million and going strong as of this writing, Journey to the West looks certain to knock Lost in Thailand off its throne as the highest grossing Chinese film ever. The Hobbit: An Unexpected Journey, took second place with an $18.5 million 3-day weekend. Some have suggested to me that The Hobbit’s underperformance in China is attributable to the fact that few there have read J.R.R Tolkien’s classic Middle Earth novels, but this explanation ignores the fact that The Lord of the Rings was a big hit in China back in 2004, placing fourth among all theatrical releases and first among foreign films that year. The romance Say Yes came in third with a so-so $8.4 million, off by 56 percent from its first week’s tally. Jack Reacher was just behind with a tad under $8.3 million, bumping its 9-day cume to a modest $13.3 million. Cloud Atlas finished the week with $26.3 million , just shy of its final North American gross of $27 million. With just a few more days before its run ends, it will be a close call as to whether the film will gross more in China than stateside. Either way, Cloud Atlas will wind up earning a remarkable 20 percent of its worldwide total in Chinese multiplexes. Year-to-date, PRC box office receipts are up a scorching 43 percent over the same period last year. U.S. films account for just 16 percent of the total, compared to 47 percent during the same period in 2012. Even more worrisome is Hollywood’s market share tumble from 70 percent in the month of February, 2012, to 15 percent during February of this year. Whereas SARFT and the Chinese film authorities reacted to Hollywood’s dominance last year by imposing an extended summer blackout, they now appear to be loosening their grip a little, reportedly granting a coveted day-and-date release slot in late March to GI Joe: Retaliation. The next U.S. film to release in China will be multiple Oscar winner Les Miserables, on Thursday the 28th..Musicals don’t usually attract much business in China–so I doubt Universal will be expecting much business here. The next two major releases after Les Miz, A Good Day to Die Hard and Oz: The Great and Powerful, both set to release in mid-March, will serve as revealing litmus tests. Die Hard would normally be expected to attract China’s huge action fan audience, but as we’ve seen, American action tent-poles have underperformed of late in the Middle Kingdom. As a 3D fantasy, Sam Raimi’s Oz is also of a genre that traditionally excels in China, Hobbit notwithstanding. The classic 1939 MGM favorite is well-known and well-liked there. If any one movie can turn things around for Hollywood, I’m betting Oz will be it. What a difference a year makes. Last February, Hollywood action pictures like Mission Impossible: Ghost Protocol and Journey 2: The Mysterious Island dominated China’s multiplexes, seizing a 70 percent share of the market and leaving only crumbs for local Chinese films. Tom Cruise reigned as box office king with his Mission Impossible hitting $100 million, only the fourth film to reach that plateau in Chinese history. Hollywood’s long-term hegemony over the Chinese movie landscape seemed secure. A year later, the situation could scarcely be more different. So far this month Hollywood’s share of Chinese theatrical revenue is barely 10 percent. Tom Cruise, whose new action flick Jack Reacher debuted to a tepid $5 million last weekend, has been supplanted by a Chinese star named Bo Huang, who has notched three successive breakout hits: Lost in Thailand, Journey to the West, and now the China-Japan co-pro (!) romance Say Yes. Chinese action-comedies are routinely cracking the $100 million threshold, while Hollywood action movies are underperforming to a troubling degree. One non-Chinese player that has fared exceptionally well in China of late is Village Roadshow Pictures Asia, which nabbed the number one and number two box office rankings last week with its co-pro entries Journey to the West and Say Yes. Journey to the West broke numerous records, including the biggest single-day gross with nearly $20 million on Valentine’s Day, the biggest weekly gross ever ($93 million) and the fastest arrival at the $100 million mark (8 days). As of Tuesday, its tenth day in release, the film’s cume stood at $122 million. I don’t think I’m going too far out on a limb here in predicting that Journey will break Lost in Thailand‘s all-time record Chinese language film gross of $201 million. Say Yes, a Chinese-language remake of the hit 1991 Fuji Television drama “101st Marriage Proposal,” debuted to an impressive $19 million. Journey and Say Yes combined gave Village Roadshow and its partners an 83 percent share of the week’s $135 million nationwide gross, also an all-time record. The previous weekly record gross was $84 million. 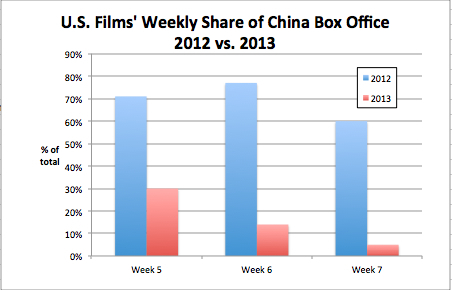 Year-to-date, China’s aggregate box office is up by 30 percent, while U.S. films are down by 59 percent. Some might blame the U.S. films’ decline on long release delays or on the individual films themselves (Skyfall, Gone and Jack Reacher), and they may be right, but I believe the most important factor is that Chinese audience tastes have shifted. Not only have several Chinese language films caught on with audiences, but the non-Chinese films that are indexing well now are different than the ones that indexed well a year ago. During the past several months the foreign pictures that have over-indexed in China have been more offbeat or intellectual movies like Life of Pi, Looper, and Cloud Atlas, or the more quirky action films like Bait and Expendables 2. The trend could turn again in favor of Hollywood’s tent-poles, with upcoming releases that include The Hobbit on February 22nd, Les Miserables on February 28th, and Oz: The Great and Powerful and a Good Day to Die Hard in mid-March (I had previously been advised that the latter two films might open on the same day, but I’m now told it’s more likely they’ll be spaced at least a few days apart). The only certainty in China is change, and for the moment, anyway, it is trending in favor of China’s local producers and those foreign producers who have committed to serving the Chinese market. 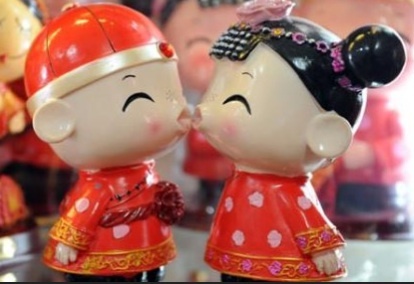 Love was in the air for Chinese exhibitors on Valentine’s Day as date night sweethearts showered local movies with unprecedented affection. Admissions reached a record 4.5 million for the day, resulting in a 190 million RMB ($30.5 million) nationwide gross, a new single-day PRC record that surpassed the previous record of 140 million RMB by 36 percent. Journey to the West: Conquering the Demons was also red-hot, shattering Transformer 3’s nearly 18 month-old single-day record of 112 million RMB with a 122 million RMB ($19.6 million) tally. Journey’s 6-day total stands at approximately $80 million (the 7-day cume will be about $92 million), which means it has sunk Titanic 3D’s single-week record opening gross of $74.7 million. If its momentum continues Journey could conceivably surpass the Chinese language film record of $201 million set recently by Lost in Thailand, and even the all-time record of $209 million that has been held by Avatar since early 2010. The resurgence of Chinese language films at PRC multiplexes is a trend that warrants close scrutiny. In the past two months three Chinese films have exceeded $100 million in revenue, but it has been nearly a year since a Hollywood film did so. During the past six months the top of the box office chart has been dominated by local films. Chinese audiences have clearly shifted their attention—and their RMB—toward locally made films, and they have become more selective about the foreign films they attend. It’s not that Hollywood movies aren’t performing well in China, it’s just that the billion dollar global blockbusters that dominated China’s cineplexes last year have been underperforming of late. I’ll explore this topic in more detail next week, after we see how well Jack Reacher performs over the weekend. Wong Kar-Wai’s Grandmaster, starring Tony Leung and Zhang Ziyi, opened with $25.8 million in its first six days in China, extending a record-smashing 7-week run during which at least one film every week has grossed $25 million or more at the Chinese box office. The film, an action-biopic about Bruce Lee’s legendary trainer and kung fu master Ip Man, beat out long-running hits CZ12 and Lost in Thailand last week to top the charts. 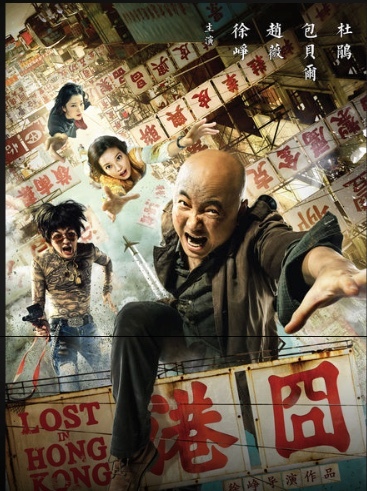 Director Wong, notorious for his budget and schedule overruns, out-did his tardiness record this time with a film that he first publicly announced all the way back in 2002. He released the picture’s first teaser trailer in summer, 2010, and pushed back several release dates as he tinkered with the film in post production. After missing his December 18th release date, he was reportedly still putting finishing touches on the film just hours before its eventual world premiere on January 6th. The first-week grosses would have been higher except that the film arrived at least a day late at many theaters. In second place for the week, Jackie Chan’s action-comedy hit CZ12 added $13 million to solidifiy its standing as the mainland’s second-highest grossing Chinese language film ever after Lost in Thailand, with a 25-day cume of $127.1 million. In its fifth week of release, Lost in Thailand fell 72 percent to $8.9 million, a surprisingly sharp drop that raises the question as to whether it can beat Avatar for China’s all-time box office record. Lost already holds the admissions record with over 38 million tickets sold, but Grandmaster’s dominant opening last week may just have ruined Lost in Thailand‘s chance to become the first Chinese film in the modern multiplex era to take the mainland’s all-time box office revenue crown. Lost needs another $17 million to achieve that distinction, and with Grandmaster stealing its thunder last week and with the James Bond pic Skyfall entering the picture next week, Lost in Thailand, the little ($4 million budgeted) picture that could, may not have enough steam left to push it over the top. Skyfall‘s release on January 21 will bring an end to the nearly two month long SARFT blackout on major Hollywood releases. The Bond pic can be expected to perform well, though it will undoubtedly be hurt by SARFT’s two-and-a-half month delay in releasing the film, a lag which has allowed massive illicit pirating and online viewing that will cut into the film’s theatrical potential. Still, at least Skyfall won’t be subject to the simultaneous release with The Hobbit that many had feared; that picture has been held back in the PRC until late February. There are numerous American film releases ahead with strong market potential, but don’t expect a repeat of 2012’s first half, when Hollywood seized a 63 percent share of the market. SARFT won’t be caught off guard this time, and will be doing everything it can to maintain the respectable appearance of a 50 percent or better market share for Chinese language movies. 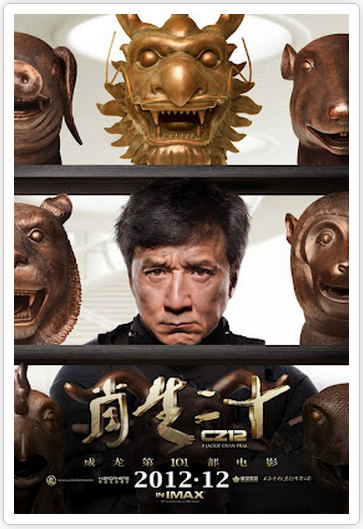 Jackie Chan’s action comedy CZ12 took in $37.6 million last week in leading China to another record-smashing session of $86 million in total weekly box office, a 139 percent increase over the same frame in 2012. China’s multiplexes have been overflowing with business of late. After a record-breaking December 2012 that saw box office takings increase by 74 percent over December 2011, January looks set to continue the sizzling pace. Current box office champs CZ12 and Lost in Thailand have positively walloped last year’s January frontrunners, The Flowers of War and Flying Swords of Dragon Gate. The latter two films were 25 days into their runs by January 8th, 2012, with Flowers at an $88.5 million cume and Flying Swords at $79.4 million. This year, by comparison, as of January 6th Lost in Thailand had finished its 26th day with a $182 million cume and CZ12 its 18th day of release at $113 million. The two current films have earned 76 percent more revenue in 6 fewer screening days than last year’s leaders. CZ12 is now the 2nd highest grossing Chinese language film and the 4th highest grossing of any film, domestic or foreign, in mainland history. Lost in Thailand is poised to surpass Avatar‘s all-time box office record of $209 million by the end of this week or early next. With the long-awaited Wong Kar-Wai action-biopic The Grandmasters opening today and Skyfall marking the return of Hollywood fare to the PRC on the 21st, January will likely be another record month. This extraordinary year-on-year growth signals an inflection point in China’s movie market evolution. The rapid addition of new cinema screens has certainly contributed to the mainland’s blistering run, but that’s only part of the story. More importantly, what has changed is that moviegoers have been coming out for Chinese movies with unprecedented frequency. They have shown that a quality local film can draw just as well or better than a Hollywood blockbuster. If China’s filmmakers can continue to make movies that Chinese audiences want to see, China’s trend of annual box office increases of 30 to 40 percent should continue through the rest of this decade. Back in the fall, most everyone who follows China’s film industry predicted a record-breaking December. Three films by three iconoclastic Chinese directors—Feng Xiaogang, Wong Kar-wai and Jackie Chan—would sweep audiences into the multiplexes, with each picture grossing around US $100 million or more. Confidence was high that 2011’s December box office record of $218 million would be shattered and that a $350 million record-setting month was in store. Now, as December draws to a close, the prognosticators can congratulate themselves at least on the latter point: China’s box office is running a scorching 70 percent ahead of last December, and the $350 million record should be in the bag before New Year’s Eve. But the path that China took to get there was one that no one could have foreseen. The first step in December’s long march to glory was the surprising performance of Taiwanese-American director Ang Lee’s film, Life of Pi. Pi enraptured Chinese audiences with its lush 3D images and its weighty philosophical themes, becoming only the third non-Chinese film to achieve a higher gross in the PRC than in North America (the other two films are the American re-release, Titanic 3D, and the Australian shark attack thriller Bait). Pi would have likely reached $100 million in China if SARFT hadn’t clipped its run at 30 days on Sunday, so it finished with an $89 million final gross. 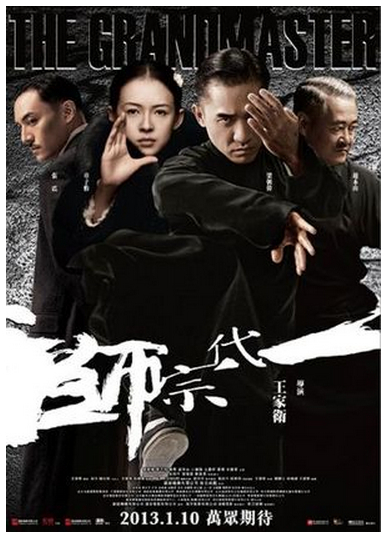 The next surprise was that Wong Kar-wai’s star-studded action pic The Grandmasters was pushed from its December 18th slot to January 8th, 2013. At first this appeared a blow for Grandmasters, as it will completely miss out on the December box office bonanza, but the pushed date may actually be a blessing. Grandmasters would probably have gotten buried in the fierce pre-New Year’s competition, and January tends to be a strong month in China, as was proven by the early 2012 successes of Flowers of War, Flying Swords of Dragon Gate and Mission Impossible 4, which launched last January and became the year’s first $100 million grosser. Another shocker was the dismal under-performance of Feng Xiaogang’s war drama Back to 1942. The film’s grim and depressing themes, underwhelming marketing, and poor critical reception (my favorite quotes called it a “daisy-licking drama,” “a sledgehammer epic” and “an emotional strip-mine”) combined to diminish turnout. 1942’s $60 million gross would be heroic for most Chinese pictures, but with its reported $40+ million cost and $100 million expectation, 1942 caused the stock of distributor Huayi Bros to tank by 20 percent in the first few days after its release. 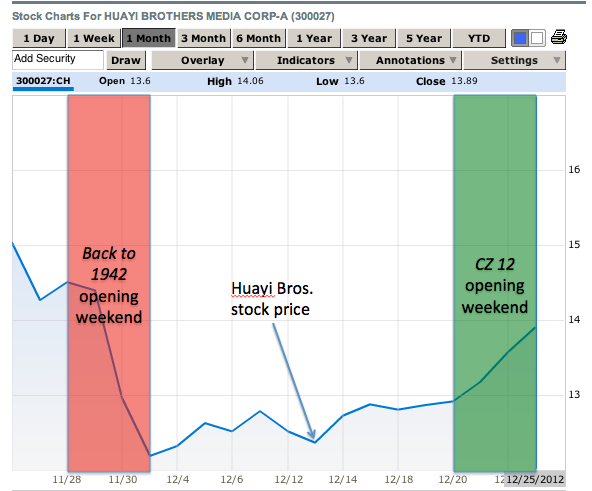 Huayi’s stock regained some of its losses after it released CZ12 a few weeks later, but the stock of director Feng Xiaogang may not recover so quickly. The biggest surprise of all was the emergence of sleeper hit Lost in Thailand, the low-budget comedy that has smashed dozens of Chinese box office records on its way to becoming the highest-grossing domestic Chinese film of all time. Only two weeks into its run, Lost in Thailand is now certain to surpass Titanic 3D and become the highest grosser of 2012. 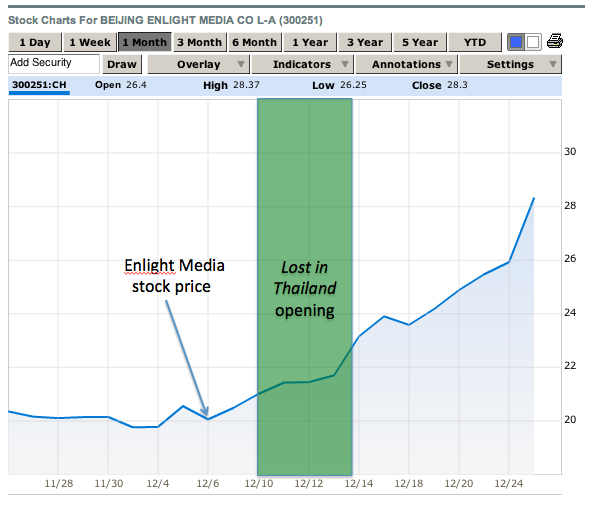 The little comedy that could has propelled the stock of its distributor, Beijing Enlight Media, to a 40 percent gain this month. 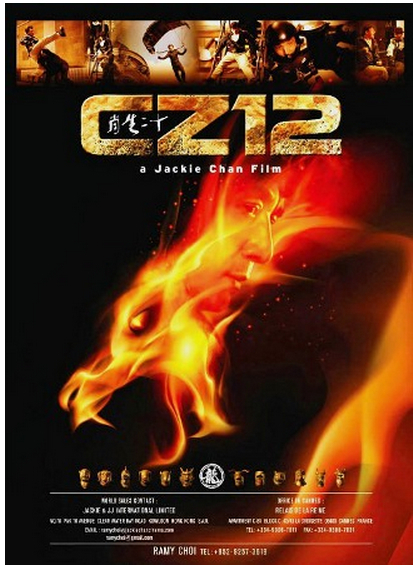 The only detail that Chinese box office watchers predicted correctly was the success of Jackie Chan’s CZ12. The action-comedy opened to a $35 million first-week gross and, with little serious new competition this week, has a good chance of crossing the $100 million threshold by early January. All told, December’s box office result will beat April’s prior monthly record by more than 35 percent. 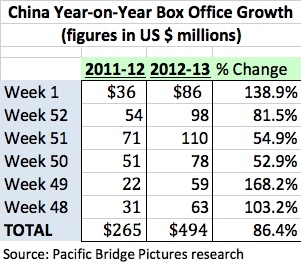 With the PRC’s box office record books being re-written on a weekly basis these days, film distributors can look forward to a very happy new year in 2013. On Thursday Jackie Chan’s and Huayi Bros’ action-comedy film CZ12 (formerly known as Chinese Zodiac) confirmed a reality that should strike fear in the hearts of Hollywood’s studio executives: China doesn’t need Hollywood films to break box office records. One-man band Chan, who wrote, directed, produced and DP’d the $50 million CZ12, has exceeded all expectations by delivering a film that set a new December single day record in China with 43 million RMB (US $6.8 million) on Thursday, adding fuel to an already blazing hot month at PRC multiplexes. Last week China set an all-time single-week revenue record, and this week is on track to break that record. CZ12 follows on the heels of smash Chinese hit Lost in Thailand, which will pass $100 million in its first two weeks and should easily eclipse $160 million by the end of its run (my Chinese colleague Firedeep was the first to go on record with a prediction that the film’s gross will exceed $200 million). That will make it the second highest grossing film in China’s history after Avatar. With its lower ticket prices, Lost in Thailand will actually beat Avatar’s record for total admissions. Although I haven’t yet seen it, CZ12 gets my vote as the film most likely to break out from China and become an international hit. Release dates are lined up in Russia, South Korea, Malaysia, Vietnam, and all over Greater China, and a U.S. release now seems likely. Just as Detroit mocked the clunky little imported Toyota cars from Japan in the 1950s and RCA, Magnavox and Zenith (remember them?) ignored Sony’s little transistor radios in the 1960s, Hollywood has so far done little to protect its position vis a vis China as the world’s leading provider of movies. To be sure, China has a long way to go, but if Hollywood had any common sense it would be sending legions of smart, China-savvy execs and producers to the PRC to figure out how to make movies there and profit over the long run. Instead Hollywood has yielded that advantage to the Hong Kongers and South Koreans, who are now much better positioned to ride the China wave and profit there than Hollywood may ever be. There is still time for the major U.S. studios to counteract the competitive threat from China, but the success of films like Lost in Thailand and CZ12 ought to be viewed as the first shots across the bow of Hollywood’s global hegemony. China’s December box office rally is shaping up to be the biggest story of the year in the global movie biz. After the fall’s SARFT-induced coma threatened to dampen theatrical revenues for the rest of the year, a pair of films that barely anyone saw coming has electrified PRC audiences and kept theaters filled and queues brimming for over a month. Back in the summer and fall SARFT crushed Chinese exhibitors’ hopes for a $3 billion aggregate 2012 box office when it set extended “domestic film protection periods” that kept Hollywood movies out of local theaters. Audiences mostly stayed away from the bland domestic product that was on view, and I revised my estimate of total year box office revenue down to $2.5 billion. Hopes were raised in December, when many box office watchers anticipated that a trio of Chinese language films—Feng Xiaogang’s Back to 1942, Wong Kar Wai’s The Grandmasters, and Jackie Chan’s Chinese Zodiac 12 (now known as CZ12)—would dominate theaters. December did in fact bring good tidings, but not exactly as expected. Firstly, Ang Lee’s Life of Pi confounded almost everyone’s expectations by taking the Chinese box office by storm, so to speak. What many had projected would be at most a $20 million or $25 million run instead became a blockbuster hit, with $86 million to date, making it the fourth biggest grosser in China this so far year. Not only did Life of Pi spank down Back to 1942 in China, it also handily beat its own $70 million (so far) tally in the U.S., only the third time in history that a foreign film has grossed more in China than in North America. The reportedly $4 million budgeted Lost in Thailand looks likely at this point to surpass Painted Skin 2 to become China’s biggest local language film ever, and the PRC’s 2nd highest grossing film overall in 2012. Lost in Thailand and Life of Pi paced China’s overall box office to its best-ever week as measured by admissions, with over 15 million tickets sold. These recent events have given me the confidence to raise my year-end estimate to $2.65 billion for 2012, which would make for China’s 9th year in a row of 30% or greater theatrical revenue growth and an aggregate 2,200% increase since 2004. To put that figure into perspective, had the North American box office grown by an equivalent amount, it would now be a $200 billion movie industry, rather than the $11 billion business that it is. For several years now I’ve been predicting that China will surpass North America to become the world’s biggest box office territory by 2020. I’m now going on record and moving the date up by a year to 2019.